Mumbai has finally seen some rains yesterday and today after a few erratic showers that marked the beginning of the monsoon a month back. As I sit in the balcony with a large mug of hot tea, rainy day food cravings hit me! 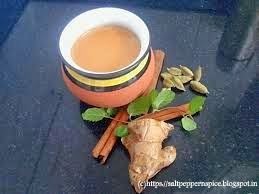 The fragrance of the earth as you touch the kulhad to your mouth for a sip, followed by the minty and gingery sweetness of the tea just about defines perfection to a tea-lover like me. 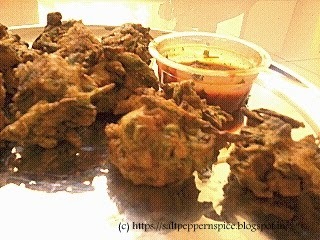 Nothing can beat the combination of hot crispy onion bhajiyas (pakoras) and chai on a rainy day. Thin slivers of onion dipped in a gram flour batter spiced with corriander powder, red chilly powder, garam masala and turmeric powder and fried to golden brown perfection... oh sigh! I also make this different version of bhajiyas- Palak Kanda Bhajiya with a dipping sauce which mesh the interesting tastes of spinach and onion and are served with a dipping sauce that has minty and corriander tastes added to your regular ketchup. Wada pav is Mumbai's most famous snack and street food and I strongly believe it must have been invented on a rainy day for rainy days! Wadas have a potato filling that has boiled and mashed potatoes cooked for quite some time with ginger, garlic and green chilly paste. This filling is then enveloped in a gram flour batter and deep fried. The prepared wada is served hot in a pav (a local bun) with a fresh green corriander and mint chutney and date and tamarind chutney Though you will find a wadapav stall at every nook and corner of the city, the best wadas are always the homemade ones... and they're so easy to prepare and gobble down! Thukpa is a noodle based clear soup from the North East region of India. Usually served with a piece of meat, I have made a vegetarian version of the soup at home. This garlicky clear soup with hints of ginger and pungency and loads of noodles to twirl around your fork makes it a fun and must-have meal for when you are watching the rains from your balcony! And of course because of the noodles and less spiciness, kids love it! Ooooh cutlets! My favourite rainy day morning breakfast when I was at St. Xavier's. A cutlet is a very simple patty of boiled potatoes and myriad vegetables cooked with spices which is then coated with semolina and fried or shallow fried. This little patty packs many flavours and enveloped in a pav (bun) it makes for such awesome rainy day comfort food. Rainy days can make you really hungry at times and then you want nothing but a quick fix! At these times there can't be anything better than warm, toasted bread served with butter melting on it with a dollop of jam for sweetness. One of my favourite jams to have is my home-made apple cinnamon jam which is fruity, sweet and has the perfect note of spice from the cinnamon in it! I can have chaat any time and anywhere! And I am sure there are many people like me! While pani puri is my go-to chaat at all times, rainy days call for some hot chaat that is filling too... and so on rainy days I make ragda patties. Ragda patties has soft potato patties served with a spicy white chickpea curry (ragda). This is then topped with date and tamarind chutney and mint and corriander chutney, sev, chopped onions and fresh corriander. Hot ragda patties with lots of sweet and tangy flavours makes for a great rainy day chaat! Imagine a cool rainy day when the skies are grey and you are served a hot parantha right off the tawa with a big dollop of butter... sounds just about right, doesn't it? Paranthas are flatbreads, usually spiced, that are made either with or without filling. On rainy days I like making these Delhi ke Paranthe wali Gali ke Paranthe. These flaky, crispy flatbreads spiced with dry spice powders between the layers are really yummy, especially when served with loads of butter! Rainy days call for corn! I cannot think of any time when we've gone and got wet in the rains and not ended the day with bhutta (corn on the cob roasted on coals and served with lime juice, slat and red chilly powder rubbed all over it). At home, I prefer making corn chaat on rainy days with lots of boiled sweet corn, chopped onions and tomatoes and masalas for the twist and taste. Oats upma can be one of those healthy yet yummy things people on a diet can have on a rainy day. A large bowl of this upma can make for a great breakfast or a light lunch or dinner when watching those rains fall away. Oats upma is a recipe I tried when I was craving upma but there was no rawa (semolina) at home. So, I made the upma in the traditional way and just substituted oats for rawa and voila! I had another tasty and very healthy dish ready to eat! So here's my list of favourite rainy day dishes... what are your's?